Lithium/iodine-PVP batteries were invented over 40 years ago. While the design has improved over the years, the same concept is still in reliable use in implanted pacemakers today. With clinical data covering decades the performance of these batteries is well understood. A critical component of these devices is the reaction of halogens with nitrogen-containing polymers like polyvinylpyridine PVP. A common challenge in both nanotechnology and surface science is the modification of the surface chemistry of a material to allow the addition of specific and relevant functionality. From as simple as washing a surface in acid (to fully protonate the functional groups) to as complicated as surface sputtering of metals and metal oxides, there are a huge range of options when it comes to these modifications. One of the more common methods of surface modification is the grafting of polymeric type materials to the surface. A variety of materials can be used to perform this task including Polyvinyl pyridine, more commonly known as PVP. This polymeric material has been shown to be an effective polymer for grafting to materials such as carbon nanotubes (Maggini et al.) along with gold (Wang et al. ), and other commonly found surfaces or nanoparticle materials. Through this process, knowing the properties of this polymer, such as molecular weight and branching is important to understanding the properties of your coated surface. Below is a good example of the information that can be obtained from GPC for this particular polymer. 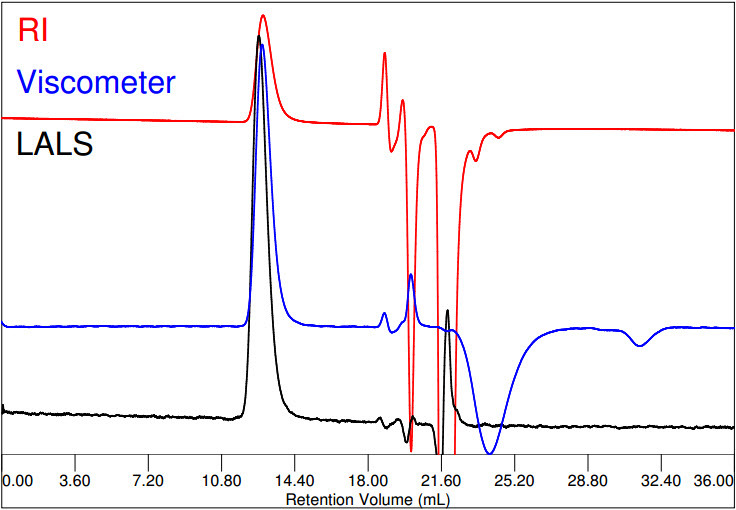 The chromatogram shows a polymer with low refractive index increment in DMF. The run conditions and some results are detailed in the table below. Chromatogram of Polyvinylpyridine in DMF, showing refractive index RI, viscosity, and low anlge light scattering LALS signal versus elution volume. Poly(vinylpyridine) (PVP ) is used in specialty applications such as a solid organic charge transfer complex in lithium-iodine batteries. These batteries have the advantage of not emitting gases even under heavy load or short circuit. 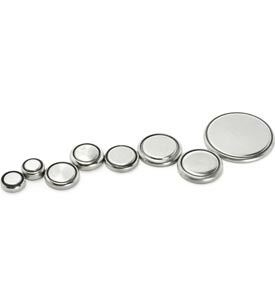 This property with the low self-discharge makes them suitable for medical applications (for example in pacemakers). For reliability, the PVP polymer needs to be well characterized. Data were acquired with a Viscotek TDAmax system. In this data set, the LALS scattering signal (acquired at a forward scattering angle of 7º) is used for directly obtaining the molecular weight without any extrapolation. Even for the relatively low dn/dc the light scattering baseline is smooth.